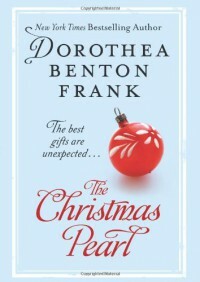 This book is about ninety-three year old Theodora inviting her dysfunctioanl family to her home in South Carolina for Christmas. The matriach is melancholy about Christmases past and wishes her family could show a little more respect for one another and realize how important the precious time spent with family is. A cook is hired for the family's Christmas meal and a substitute is called in to fill in for the original cook when there is an emergency in her family. The replacement is none other than Theodora's family's cook of her childhood, Pearl. Pearl has come to earn her wings and whip Theodora's family into shape. There are many wonderful lessons within this book, but somehow the book felt 'flat' to me. There are a lot of characters to keep straight with a lot of intricacies within their relationships. I spread this book out over a long period of time, so maybe that is why I felt a bit 'disconnected' from the characters. I appreciate the book's idea of a loved one coming back to help set a family straight and be appreciative of one another, but it just felt very forced to me.